It’s been a long time since I’ve drawn Casim properly the last time. That’s not a way to treat one of your oldest characters, if you ask me. 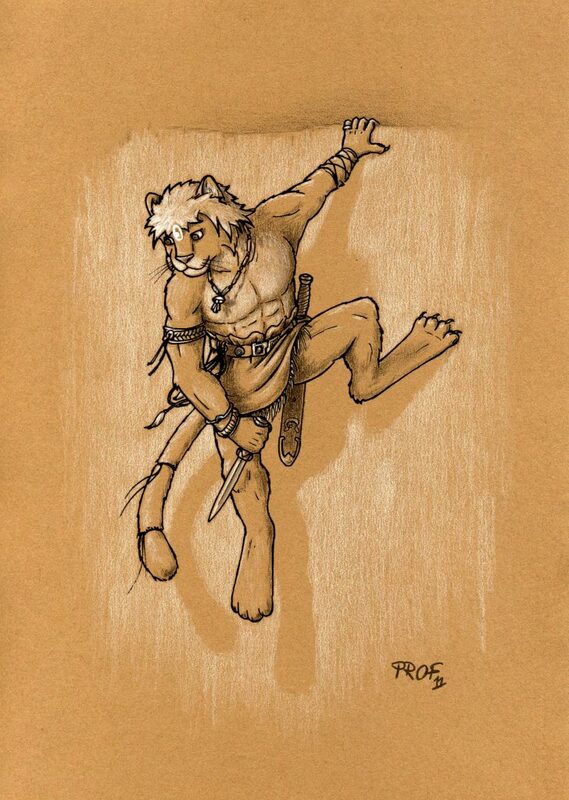 I invented him about 18 years ago, long before I read the word “furry” for the first time, so he’s more a fantasy character than a typical fur. Also, he’s protagonist of a heap of story fragments, one I actually finished (only in German language so far: https://www.furaffinity.net/view/2101995/ ) and a second one still in the making (this one will be in English). So, here he is, ready to give someone a nasty surprise. The bright white mark on his forehead, BTW, is called “third eye”, a special ability (practically any self-respecting fantasy character should have one ;) ). I won’t go too far into detail; it practically allows him to anticipate the movements of his opponents. “For eyes able to see more than only the mundane world” this gift manifests as a glowing, vertically standing oval, floating about an inch before his forehead.